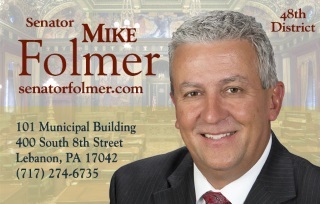 State Senator Mike Folmer is a Republican member of the Pennsylvania State Senate, he represents the 48th district, which includes Dauphin, Lebanon, and York counties. Mike currently serves as Chairman of the Senate State Government Committee. Other committee assignments include Education; Intergovernmental Operations; Labor and Industry; Communications and Technology and Rules and Executive Nominations.